Adding round corners to your documents, covers, business cards or printed materials doesn't have to be difficult. Sometimes called cornerounders, or corner rounders, these machines help you to add a beautiful rounded radius to the edges of your documents. Transcript: Welcome to MyBinding video. 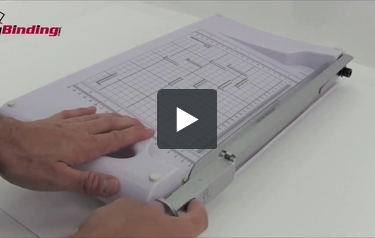 One of the most common office tools is the paper trimmer. And on the market, there is almost every kind imaginable. This video is designed to help you make the best decision for you. Welcome to MyBinding video. One of the most common office tools is the paper trimmer. And on the market, there is almost every kind imaginable. This video is designed to help you make the best decision for you. A major, very popular, category is the rotary trimmer. The rotary trimmer is very quick and safe, quick in that it goes in either direction, so there's no reset time. And they're safe, because the blade itself is generally encapsulated in some kind of housing that keeps fingers far away. Many rotary trimmers have interchangeable blades that allow you to cut with different kinds of cutting patterns; straight or perforated, scored, and different kinds of wavy designs for textured looks or crafting. In the crafting or scrapbooking world, there are many multi-blade rotary trimmers. With these trimmers, there are multiple blades built into the same housing, and then you can just dial, or switch right into it as you go between project and project. Home and small offices sometimes enjoy dual, or combination, trimmers. These trimmers come with both a guillotine-style trimmer and a rotary trimmer built into the same machine, or the same unit, for the versatility. These paper trimmers tend to be very lightweight and very portable, perfect for on the road or on the go or business seminars and conventions and things like that. They're also fantastic for more advanced scrapbookers and crafters. There are also a couple of very portable hand trimmers. And finally, there's the ever popular guillotine-style trimmer. These trimmers go from very small to very large. The majority of them are built for the office or institutional use. They're built for longevity and precision and can generally handle a lot more paper at a time, as well as much larger sizes of projects. The open blade can sometimes be very dangerous, so it's not good for the kids or the classroom. And they are limited to just the one cutting pattern. A very important note are the measuring tools. Not all trimmers are created equal in this fashion. They will all have some kind of measuring tools but some of them are far more helpful than others. Some have built-in or removable fences. This keeps papers in line and allows for consistent cutting over and over through a single project. Just keep in mind that the more measuring tools you have, the more precise and flexible you can be in your process. Happy trimming! For more demos, reviews, and how-tos, check out MyBinding.com.